Bible Verses For Facebook,SMS & Twitter app: insight & download. 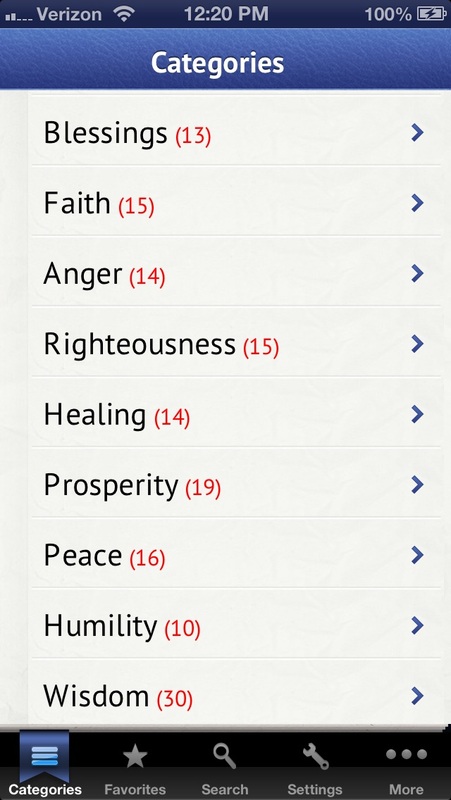 There are many Bible Apps on the App Store, but no other App brings you categorized verses that fit in a single SMS, Facebook Message or Tweet. This is a compilation of Inspirational Bible Verses that you can send in a single SMS , Facebook post or Twitter message. We combed through the entire Bible to bring you powerful and inspirational verses that you can use to cheer up a friend (or yourself) via Facebook, SMS or Twitter. Each verse can be sent in a single SMS message or Tweet, and you have the option of choosing from 4 different Bible translations!!! . Imagine inspiring yourself and your friends with small easy to digest Facebook posts, SMS messages or Tweets on a daily basis. ✓ Now with Facebook Integration. ✓ Easily Send inspirational Bible Verses via SMS , Facebook , Twitter or all 3 !! ✓ Each inspirational verse fits in a single SMS message. ✓ Each inspirational verse fits in a single Tweet. ✓ Verses broken into categories to help you choose the appropriate verse to send. ✓For less than the cost of a cup of coffee, begin to send inspirational messages to your friends!! ✓ Why send multiple SMS messages when just one will do? Let this App start to save you money Today!! Download this App now, and start to affect not only your own life, but also those around you.